I came across this article while I was browsing the net and thought it would make for an interesting read/debate. Sarah Thornton explains why art is a beacon of optimism as markets tumble. You can read the full telegraph article here then join in on the discussion. So what do you think? Is art the new gold, the new safe market investment? Thornton says that “museum attendance has surged and more people than ever began calling themselves artists”. But the question I’m asking myself is: Is museum attendance and artist growth a good thing? On one hand, the increase in artists and art may mean an artistic boom in the art market making this type of investment more widely accessible But on the flip side what happens generally when you get an abundance of something? Well in a market sense if you have 100 stocks versus 10,000 stocks the 100 stocks are going to be more valuable? But when those same 100 stocks turn into 10,000 the value plummets. How does that translate to the art world? Does it translate to the art world? 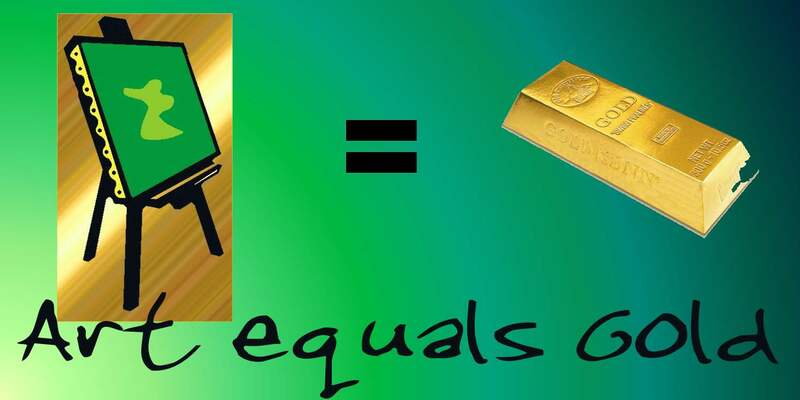 If every artist is a gold bar, then when gold bars(artists) increase will the value drop? In societies past art was valued and of value because it was a rare commodity but today artists are a growing trend because the internet has helped us/them reach beyond our city or home base making us/them more easily accessible. But, Thorton doesn’t say artists are the new gold she says ART is the new GOLD. Think about it…what does art have the makes it so valuable? Well, How about the uniqueness of each and every piece? It’s like no gold bar is alike making each and every piece valuable. So yes, perhaps ART is the new GOLD to invest in. Who decides what is “pure gold” and what is “fools gold” when it comes to art? Isn’t every piece being genuinely unique enough and valuable unto itself? This entry was posted in Art, art discussions, Artist, female artist, ideas, Uncategorized, WTF Art and tagged Art, Art article, art debate, art discussion, art the new gold, art's value, Sarah Thornton, telegraph, wtf is art on October 3, 2008 by Amanda. Well, for our sake, I hope that art is the new gold. That would make you a goldmine.